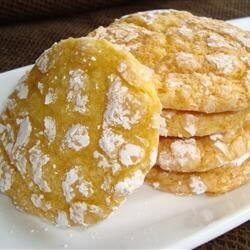 "Lemon Whippersnappers, lemon crinkles, same thing! This is a formed (ball) cookie rolled in powdered sugar, like chocolate crinkle cookies, only flavored with lemon." Definitely put in the refrigerator for a few hours before baking - much easier to handle. Everyone that's tried these cookies loves them.